What Lipton did for tea in late nineteenth to early twentieth century Britain, Maypole Dairy did for margarine. The three Watson brothers, George (1861 – 1930), Charles Henry (b.1864) and John Alfred (1865 – 1931), were born just outside Coventry to a prosperous farming family. They served as apprentices and later assistants to George Jackson, a Birmingham dairy merchant. By importing butter directly from Danish farmers, Jackson had pioneered the sale of pure dairy butter at affordable prices. He was the largest retailer of butter in the world by 1893, with 30,000 tons sold every year. Jackson’s strong reputation for butter meant that he was reluctant to branch out into margarine, which although gaining in popularity, was hampered by a downmarket image. However George Watson was free to take the chance, and he opened a margarine shop in Wolverhampton in 1887. He was soon joined by his brothers, and outlets were opened across the Midlands. The shops also began to sell cheese and butter. Maypole Dairy was a high volume, low margin business, and outlets were concentrated in working class areas, to whom the products provided a cheap source of protein. George Watson introduced a profit-sharing scheme for management from 1890. Shortly afterwards, in a pioneering move, the scheme was extended to all employees. 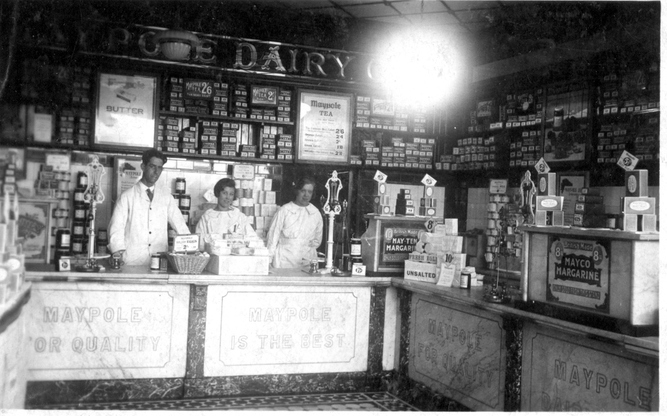 Maypole Dairy was the largest retailer of margarine in Britain by 1895. The business had 60 shops, eight creameries in Ireland and one in England, and purchasing offices in Denmark and Sweden. Maypole and George Jackson underwent a merger in 1898, and the company was incorporated with a share capital of £1 million. George Watson became chairman. The company had 185 retail shops and 17 creameries. Maypole acquired a margarine factory in Godley, Manchester, from Otto Monsted Ltd, a Danish company, in 1902. It was capable of producing 200 tons of margarine every week. 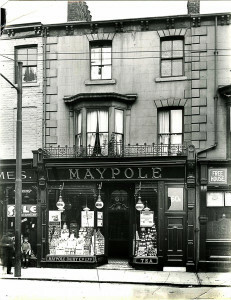 Maypole had 560 retail shops by 1908, and was the largest retailer of tea, butter and margarine in the United Kingdom. Maypole reported a net profit of over £550,000 (£425 million in 2015) in 1912, of which all but £50,000 was distributed among shareholders as a 212.5% dividend. * By this time there were 712 stores across the United Kingdom, and the leading lines were margarine and tea. That year, George Watson was appointed a baronet. Maypole, and the Dutch producers Jergens and Van den Bergh produced most of the margarine sold in Britain, with Maypole producing almost as much as the other two combined by 1913. 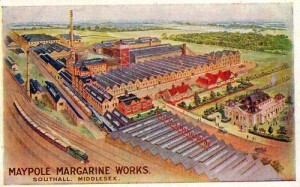 The Manchester margarine factory was sold to Lever Brothers in 1914. Maypole acquired Otto Monsted’s margarine factory in Southall, Middlesex, and an edible oils refinery in Erith, South East London in 1915. The Southall factory covered 22,500 square yards, employed around 650 people and was the largest margarine factory in the world. It had a weekly output of 700 tons of margarine. Maypole margarine differed from competitors in that it was produced from tropical nuts and seeds rather than animal fats. Maypole established a groundnut operation in West Africa to provide raw material for margarine production in 1915. 25,000 to 30,000 tons of groundnuts were produced annually by 1919. Maypole dominated the sale and manufacture of margarine in the United Kingdom, with a 50 percent market share by 1918. Margarine accounted for 85 percent of Maypole sales. Maypole capital amounted to £3 million (equivalent to just under £1 billion in 2015) in 1919. Turnover exceeded £36.5 million (£13.8 billion in 2015) in 1921. However shortly afterwards the company began to struggle in the face of cheap imports and the failure of its West African business. Six directors retired in 1924, including the chairman, George Watson, and they sold their stakes to Home & Colonial. Now the majority owner, Home & Colonial was itself controlled by Jurgens. Maypole increased its product lines to include jam, marmalade and lard from 1925. In 1928 biscuits were added, and cheese was re-introduced in packaged form. 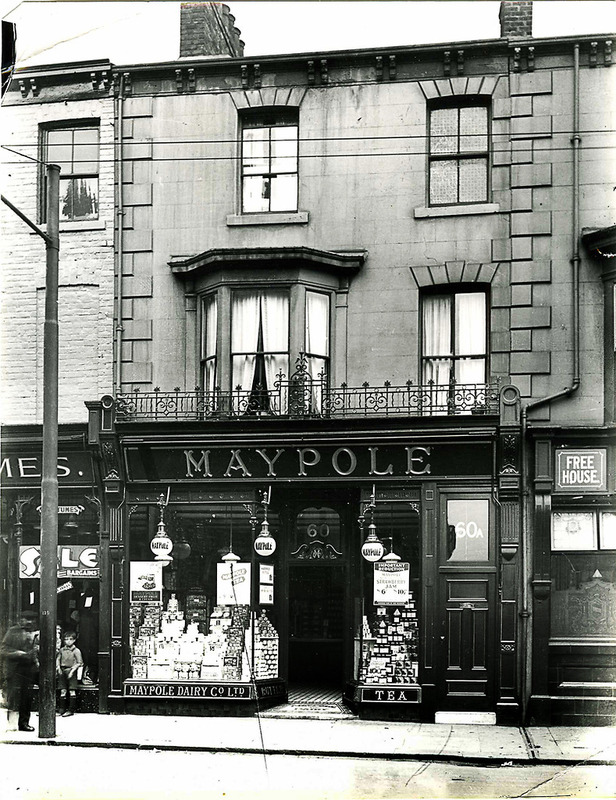 Maypole had over 1,040 retail outlets by 1929. That year, Jurgens and Van den Bergh merged with Lever Brothers of Britain to form Unilever. Maypole was now contractually obliged to purchase all of its margarine from Unilever. The Maypole margarine manufacturing sites were made redundant by the Unilever purchase, and were re-appropriated for the production of Wall’s sausages and ice cream. In 1930 Unilever created a holding company for its grocery chains; Lipton, Home & Colonial and Maypole Dairy, called Allied Stores. The company had a capital of £13.3 million. Each retail company continued to be run independently, but there was co-operation in various aspects of the business. George Watson died in 1930, leaving an estate valued at over £2 million (about £805 million in 2015). Maypole’s West African venture was sold to the United Africa Company, which was controlled by Unilever, in 1931. Maypole sold over 200,000 eggs in 1938. There were 977 Maypole stores and 6,334 employees in 1939. Rivals such as Tesco, which utilised bulk purchasing from suppliers, began to challenge the vertical integration model practised at Maypole. In 1943 all but two company directors, and practically all senior executives, were men who had started in the bottom ranks of the company and worked their way up. In 1947, faced with continued rationing after the war, the company began to extend its product range to include additional staples such as bacon. The independent management of Maypole ended in 1964. The Maypole name was phased out in the 1970s, when increased competition from supermarkets saw Allied Stores decide to concentrate on their Home & Colonial brand. Allied Stores eventually morphed into Safeway (UK), and the rights to the Maypole brand are now owned by Morrisons Supermarkets. Unilever continued to hold a 30 percent share of the global spreads market, until the divested their spreads unit in 2017.